Info: This feature requires Content Station 10.21 or higher. These files are typically kept together in a Dossier and a Dossier itself can hold multiple articles. When working on a story or working with a Dossier, it can be beneficial to see how each article is used as a story and which files are related to the story. For this, the Story View mode in a Dossier can be used. 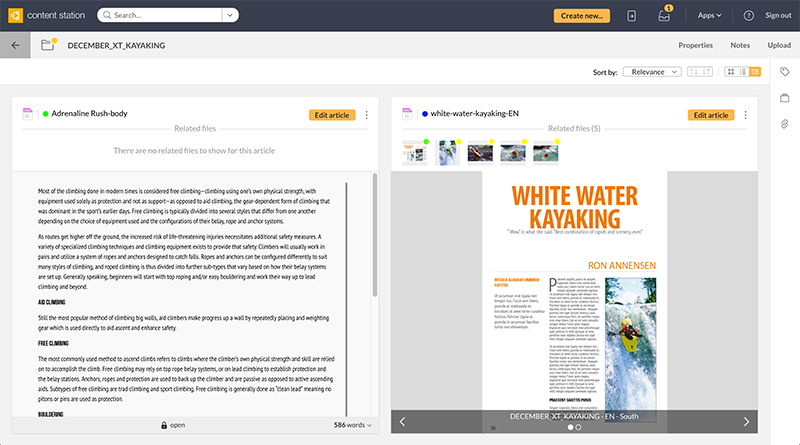 Figure: Viewing two articles in Story View mode in a Dossier. Both articles are placed on a layout. Figure: Choosing Story View mode in a Dossier. When Story View mode is enabled in a Dossier, a story is displayed for each article in that Dossier. When multiple articles exist, the newest is displayed first. The name of the article and its Workflow Status (hover the mouse pointer over the status to see the name). All files that are related to the story (only for articles that are placed on a layout). Select a file and press the Spacebar to view it in fullscreen mode or view additional info by opening any of the panels such as the Properties panel or the Versions panel. Right-click a file to access its context menu. Hover the mouse over a file to see its name in a tooltip. Double-click a file to open it. When more related files exist than can be shown, hover the mouse over the Related Files section and use the controls to navigate the files. When placed on a layout: a preview of the first page on which the article is placed. When the article is placed on multiple Editions or multiple layouts, each Edition or layout is shown in a carrousel. Click the controls to navigate through the layouts. Right-click the preview to access the context menu. Hover the mouse over the preview to access the button for showing it in fullscreen mode. Double-click a preview to open it. When not placed on a layout: the content of the article. Note: The context menu for the article can be accessed by clicking the 3 dots next to the 'Edit article' button. 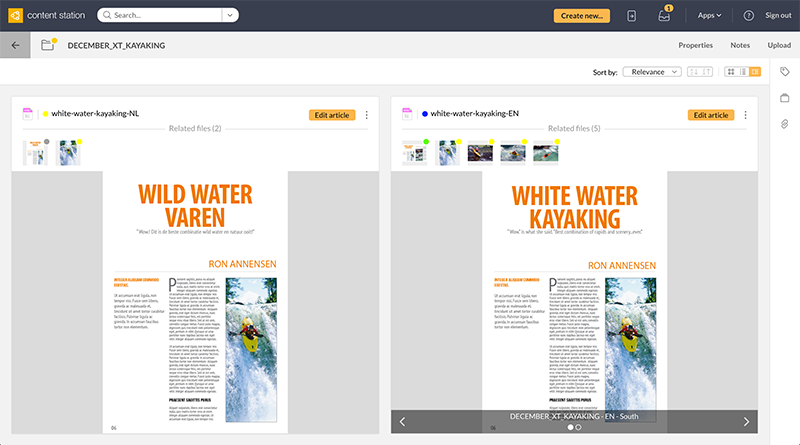 Figure: Two articles shown in Story View mode in a Dossier: the left article is not placed and therefore only the content is shown and no related files. The article on the right is placed on two Editions in a layout; each Edition can be viewed by using the controls at the bottom.